Do you take your kids to see Santa? Every year of my childhood my mom took us to see Santa. We would drive into the city, head to the big department store and wait for hours in the queue to see Santa. I still remember standing there with all my siblings, waiting eagerly to see him, and my mom telling us all to behave and stand patiently! My mom has kept all the santa photos in one big album… and it’s hilarious to look through them. From the time I was a baby (crying on Santa’s lap) until the time I was 20 (looking very awkward standing next to him! ), there is a photo from every year. So tell me, is visiting Santa a tradition you did when you were younger? Do you now take your own kids to see Santa? I’m curious to know which countries do and don’t do this! p.s. That photo is of my two boys when they were younger (2½ and 6mos) and it’s my favourite of all our Santa photos. 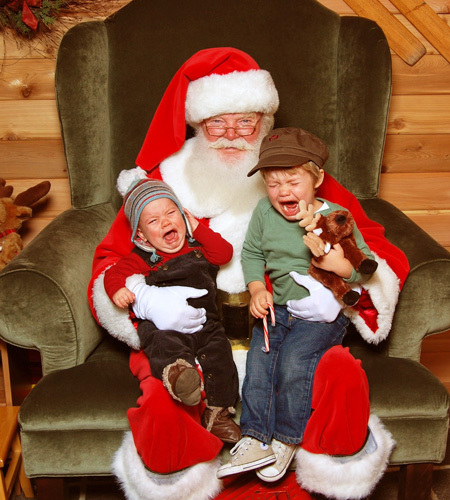 I just love how they’re both crying… and Santa looks so perfectly poised! We went every year until we stopped believing in Santa. We have taken Levi since he was a baby. We have classic screaming baby photos. He got over his fear at 3, though Santa couldn’t touch him. Last year he was totally cool with Santa and sat on his lap. We will keep taking him until he ceases to believe in Santa, which I hope isn’t for few more years. My daughter is afraid with Santa, too!!! PS Would love to get in touch with someone on your staff about our shoes being represented via Babyccino in some way! We brought my daughter since she was 2 , and the first time it was a nightmare a long hour queue for a big scream lots of tears and a super fast run in the opposite direction of Santa The following years were definitely better. Last year Roy was 11 months old and everything went out very well , nice picture both Lidia and Roy smiling. This year Roy refused to seat on Santa’s lap but and wanted mum beside Him on the photo. I love your photo so much. It’s so true!!!! So many people trying to get a smiling child next to Santa, but when they’re young, tears and screams are the only thing you get. Both my boys (3 & 6) enjoy visiting Father Christmas. Youngest is still shy but they still always want to ask him for a nice gift. We’ve never had either of the boys sit/pose with the big man himself and I imagine that’s what causes all the tears? I think that photo is one of my favourite of all times, it is HILARIOUS! that poor Santa! I didn’t think it was a French thing to do! But it’s interesting because this tradition exists here in London… and all over the US, of course. It’s also funny how you get different types of Santas. Some are more believable than others. Some are downright scary (I don’t blame the kids for being so terrified). The photo is so great! I love it! The face of Santa so calm 😉 My son was also afraid and crying till he was 4. Now he like him a lot . Wow! This was like reading the story of my life. We would drive to Seattle (over an hour drive) and head to Nordy’s. We’d stand in line for what felt like days. I always loved santa b/c I knew he was bringing the presents but my brother was always hysterical!! My mom forced us EVERY year (no exceptions) Now that we all live apart my crafty sister photoshops us all into an old santa picture. Mom loves it! I will be taking my daughter this weekend for her 1st Santa picture… Let’s start the torture!